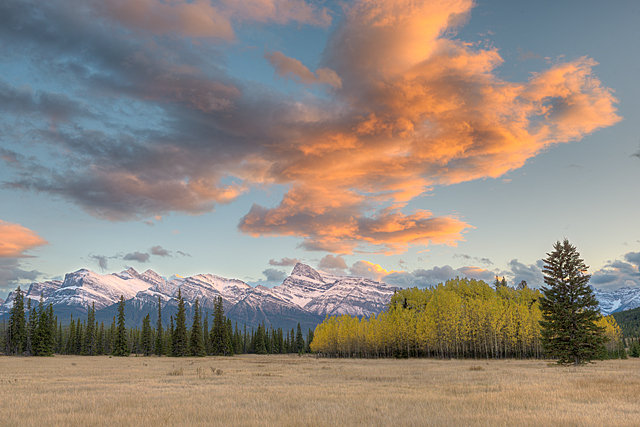 From the early evening of September 30–the eighth day of my trip to the Canadian Rockies–until the early afternoon of October 5, my final day in the region, I was one of the participants on a photo tour led by Royce Howland, a professional photographer who has lived in Alberta for decades and has been leading photo tours in the area (and elsewhere) for years. Before I continue with my chronological detailing of my time in the Rockies (the next entry in this vein will be of Day 8, including the beginning of the tour), I want to spend a bit of time discussing the tour experience itself. As long-time readers of this blog know, on the rare occasion when I review a product or service, you’re receiving my honest, uncompromised appraisal–for what it’s worth. When I take the time to critique something in the photo world, you can be sure that I have no vested interest in the subject. My reviews are based on my experience as an ordinary customer who has received no special considerations of any kind. That’s the case in this instance as well; I paid full-price to be a participant on this fall photo tour and I’m not receiving any compensation based on anything I write. Nor, I hasten to add, have I been asked to write this piece; what follows is entirely of my own volition. Cost. Workshops/tours are generally pretty expensive. Whether they’re “worth it” or not is very much in the eye of the beholder, but ordinarily, unless I believe that there’s going to be something about the workshop/tour that I’m not going to be able to attain on my own, I conclude that it’s not worth my while financially to sign up. Lowest Common Denominator. For obvious reasons, workshops generally have to cater to this principle or face the prospect of financial failure. Generally speaking, these kinds of sessions appeal more to beginning or relatively inexperienced photographers, because it’s these folks who are most interested in assistance with the technical fundamentals of the endeavor. Whatever my photographic acumen, I’m not a newcomer to the craft so–in concert with point #1 immediately above–the last thing I want to do is spend my money for service that I don’t need. Time in the Field. This point is essentially an addendum to #2, but most workshops don’t utilize time in the field nearly as intensely as I do. I understand why this is so; most potential paying customers don’t want to be in the field from dawn to dusk, with little if any interruption; and they also expect to eat regular meals at relatively normal times. While this is understandable, these aren’t my priorities when I’m on a photo trip. As is the case with my cash, I don’t want to spend my time doing anything that isn’t directly furthering my photo opportunities when I’m on location. With these points working against my interest in workshops/tours, why would I sign up for one? The main attraction for me is leveraging the expertise of the person leading the enterprise. Particularly when I’m at a location that is entirely new to me, relying on the experience of someone who knows the location far better than I ever could is potentially of considerable value to me. In essence, if I’m convinced that the tour leader will be able to guide me to places at the best times to produce meaningful imagery that I would be unlikely to find myself and I’m confident that points 2 and 3 above won’t be major issues (based on a discussion with the event leader regarding the proposed itinerary and modus operandi), then I can typically overcome point #1…as long as it’s not so expensive as to be a budget buster for me. Since I decided to attend, obviously I was able to satisfy myself that my requirements would be met. The price of the tour–which included lodging and meals during the parts of six days that we were on site–was reasonable. But, just as importantly, I also determined that dealing with my other concerns wouldn’t be a problem. The tour (not a workshop, you’ll note) was billed as being appropriate for “intermediate and advanced photographers” and it was made clear that the overarching emphasis would be on image-making opportunities in the field…all day, every day. That sounded right up my alley. One other matter, which initially concerned me, turned out to be among the best–if not the best–reasons to join the tour: its focus on specific locations. The tour itself was based at a small lodge in David Thompson Country–part of the eastern front range of the Canadian Rockies. The Aurum Lodge is located on Highway 11 in Alberta, about 30 miles west of Saskatchewan River Crossing and the vast majority of the time that the tour spent in the field was within about a half an hour of the lodge itself. I knew nothing of this region–even by reputation–prior to attendance and my initial concern was that time I was spending there could be better spent at some of the endless spots in Banff, Jasper and Yoho National Parks on my own. But an on-line discussion with Royce effectively put that consideration to rest. Without even really trying, he convinced me that there were more than enough marvelous locations near the lodge–and ones that weren’t particularly well-known at that–to keep us plenty busy for far longer than the duration of the tour. With all that in mind I decided that taking a spot amongst the tour participants–and there were only three others (smaller is virtually always better when it comes to these sorts of things)–was worth the expense, and the time (since the days I devoted to the tour were days I wouldn’t be able to spend in other places photographing other things). As I continue to post detailed chronological entries covering the remainder of the trip you may be able to draw your own conclusions, but for the time being you’re probably wondering whether, in hindsight, in making the decision to attend I made the right choice. The answer is “yes,” and resoundingly so. All of the images accompanying this post were made during the tour, and this is just a small taste of the photo opportunities we experienced. 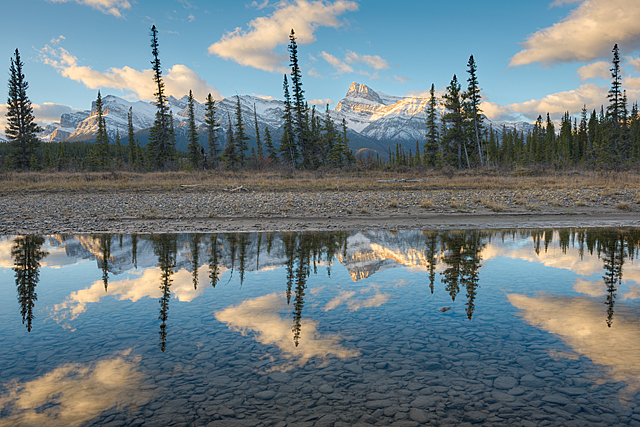 David Thompson Country turned out to be every bit as breathtakingly beautiful as any of the other areas in the Canadian Rockies that I had the opportunity to visit and it had the added benefit of being almost completely empty. We were on site for parts of six days and scarcely ever saw another soul, other than the occasional passing vehicle on Highway 11. 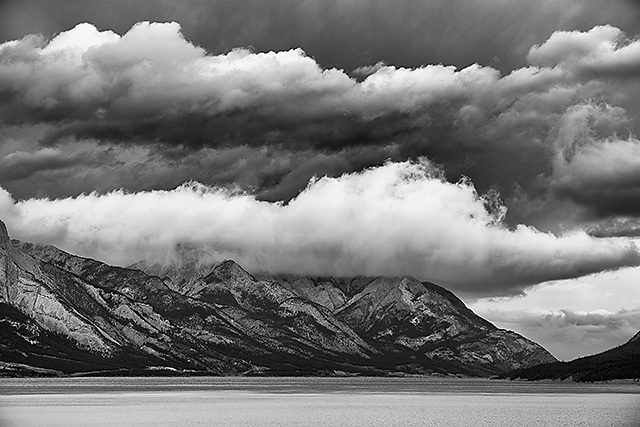 This made careful, considered landscape photography possible, which was an exceptionally pleasurable experience for me. What’s more, these were locations that, almost without exception, I never would have known about, let alone photographed, had I not joined the tour. 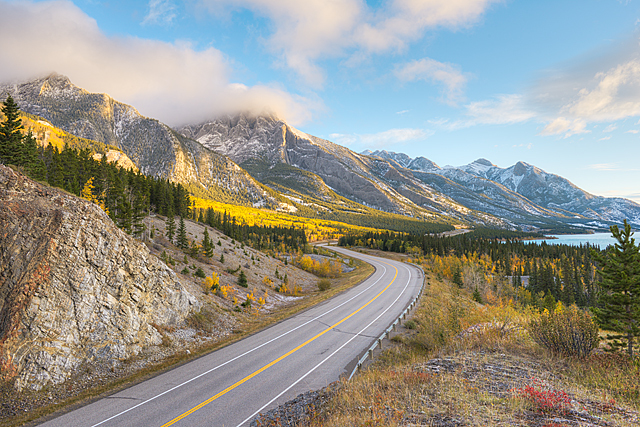 Various spots in Banff and Jasper National Parks are the iconic locations in the Canadian Rockies; you really never hear about David Thompson Country. I feel very lucky to have had the opportunity to experience this sub-region (particularly the Kootenay Plains area, which captivated me). If there were ever any doubts at all about Royce’s encyclopedic knowledge of the area and his ability to correctly discern where to go and when, they were put to rest immediately and conclusively. We spent the entire tour maximizing excellent opportunities and minimizing time spent traveling from place to place. The weather wasn’t always cooperative, but it never is (I direct you to my Lake O’Hara experience), and I was impressed by just how well time was apportioned at each location. I was every bit as productive photographically, if not more so, during the tour as I had been on my own, earlier in the trip, and that’s a rare thing in my experience. As advertised, the emphasis was on time in the field, to the nth power. This had been a major issue for me, as I indicated above, and I wasn’t disappointed. More than any other workshop/tour I’ve ever attended, this one came the closest to matching my own typical in-field workflow. We were out from before dawn until after dusk every day; the only real concession was the evening meal, which was timed so that it wouldn’t conflict with pre-sunset/sunset shooting. Breakfast was scheduled to precede a dawn shoot every day and lunch took place in the field, with minimal loss of time. On many days there was at least some hiking involved, but if you’ve been reading this series you know that’s right in my wheelhouse. Over all, for me, this is as good as it gets. As a windfall, as a result of participating in the tour I had the opportunity to do one of the Morraine Lake area hikes (Consolation Lakes) that I had to bypass when I was in the area on my own due to the bear-related multi-person hiking restrictions put in place by Parks Canada. That was the cherry on top of the sundae. While there was no formal instruction in field during the tour, Royce and his co-leader, Dan Wheeler, were always available for questions about technical and aesthetic matters. To the extent that subject matter wasn’t readily apparent, Royce always provided an overview of shooting possibilities at each location. We did have a couple of informal, optional get-togethers in the evenings back at the lodge after returning from sunset shooting on several nights. Even though they were optional, everyone attended each session. As much as I like to think I know about the intricacies of certain nuanced photographic subjects, such as HDR, Royce knows more and I had the opportunity to pick his brain about a few advanced topics. At least some of these discussions have caused me to alter a few of my own practices moving forward. Also adding to the success of the tour was the fact that the other participants were extremely friendly, open and a pleasure to be around. I’m not aware of a single conflict that ever arose at any point–not even a small one. At least some of that had to be a function of the easygoing, yet confident, tone that Royce set for the tour. Additionally, while I was probably the most experienced landscape photographer among the participants, others had backgrounds in other areas (e.g. street photography, architectural photography, etc.) that made for an intriguing array of approaches to the subject matter at hand. Finally, the accommodations at the Aurum Lodge were first rate. The hosts–Alan and Madeleine Ernst–were always friendly, helpful and accommodating. The lodge itself was comfortable and well-appointed, despite being in such a remote place, miles from the nearest services, and entirely off the grid. 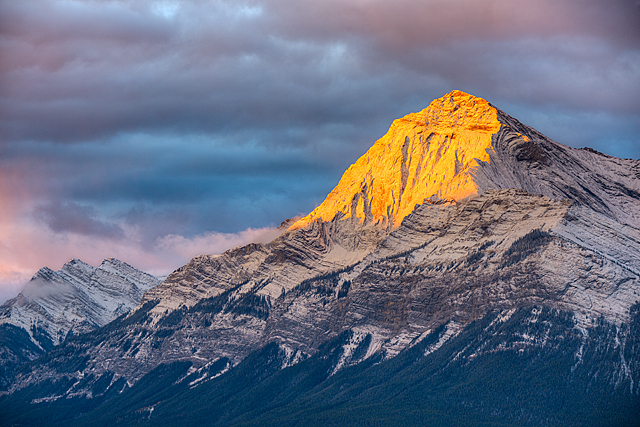 I heartily recommend Royce’s Canadian Rockies photo tours. It’s a phenomenally effective way for someone who already has the benefit of at least some photographic background to experience the beauty of a little-known, oft-overlooked area, led by someone with an intricate knowledge of the entire region. My trip–which was already going well–was made significantly better by my decision to attend the tour. Once you have the opportunity to see some of the places we visited as I post the remainder of the daily entries, you’ll have an even better sense of my meaning than can be gleaned from any written description. I love that country. Went camping there one year and always look forward to a return. Great recommendations for Royce Howland and Aurum lodge. (attended an informative talk by Royce and stayed at Aurum lodge for a weekend).. The last photo is full of the autumn colour and the lake-just gorgeous.Excited about what you will share from your journey in the days ahead. Thanks, Jane. 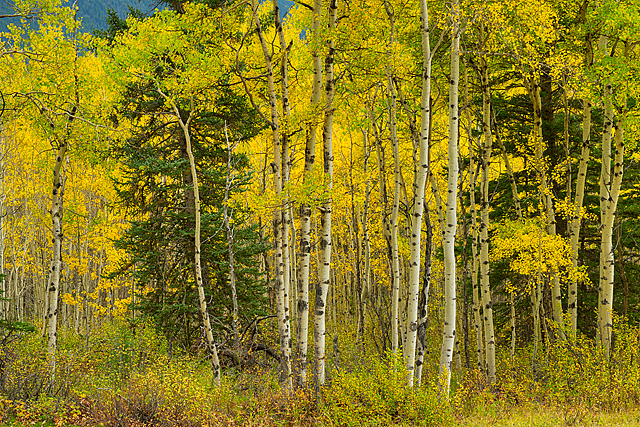 There will be many, many more images from David Thompson Country in the remaining installments. You’ll probably recognize at least some of the locations. There are several good things to take away from this post. One, is that you can’t beat local knowledge of an area. Two, is that while well known parks may have awesome scenery, many times the scenery nearby is just as beautiful, or even more so, if one takes the time to explore it. I’m glad that the tour worked out well for you, now there is another area to add to my list of places I hope to visit, and your spectacular images only fuel that fire! You’re right–access to someone local who knows the area is worth its weight in platinum. And you’re also absolutely correct that there are often areas near national parks that are often every bit as impressive as those within–I can think of a few examples in the U.S. right off the top of my head (near the Smokies, near Arches NP. near Yosemite, etc.). The advantages of many of these secondary spots for photography is that they’re always less well-known than the parks themselves and, therefore, are essentially always far less crowded. That was absolutely the case in David Thompson Country, which had a remarkably desolate feel to it…it’s a great place. Thanks for taking the time to leave a comment–much appreciated. Sound like you had a guided tour to remember for all the right reasons and the images are the proof. Enjoying your Canadian Rockies trip and look forward to the photos from this particular tour. Thanks very much. I hope you’ll enjoy the forthcoming installments covering the days of the tour.